The infant at the center of Rebecca Gilman’s “Luna Gale” is the daughter of meth-addled teenagers who love her but don’t properly care for her. 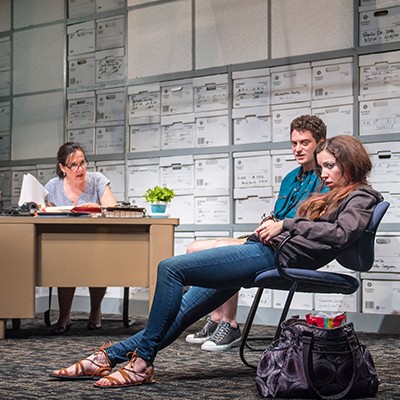 In the Bay Area premiere presented by Aurora Theatre Company, she comes to the attention of a social worker when she’s so ill that her parents take her to the emergency room in their hometown of Cedar Rapids, Iowa. As they wait, the mother, Karlie (Alix Cuadra) is uptight and fidgety, scarfing Skittles, while the father, Peter (Devin S. O’Brien) is almost comatose. That’s when the social worker, Caroline (Jamie Jones), meets them. Karlie’s divorced mother, Cindy (Laura Jane Bailey), a nursing assistant, wants to care for Luna and seems like a logical choice. However, Caroline is besieged by doubts when Cindy implies that she wants to adopt and indoctrinate the baby in her evangelical Christian beliefs. Karlie and Peter work toward getting off drugs, but they adamantly oppose Cindy’s effort to take away their parental rights and adopt Luna Gale. Cindy’s minister, the smarmy Pastor Jay (Kevin Kemp), supports her efforts, as does Caroline’s bureaucratic young boss, Cliff (Joshua Marx). Caroline does her best to act in Luna Gale’s best interests, but she’s influenced by her own biases and hampered by an overwhelming work load worsened by budget cuts. Playwright Gilman leavens the first act with some humorous lines, but the second act has some harrowing scenes as more is learned about Caroline’s past and the event that caused Karlie to go astray and despise her mother starting when she was 15. A subplot involves one of Caroline’s clients, Lourdes (Jennifer Vega), who has aged out of the foster care system at age 18 and goes to college. Things don’t turn out well for her. There’s more hope for Luna Gale as the play ends. Director Tom Ross ably steers the actors through their characters’ emotional mine fields, resulting in an absorbing, riveting drama. Jones is especially noteworthy as Caroline reacts to events and revelations that make her job more burdensome. Kate Boyd’s functional two-level set is complemented by Kurt Landisman’s lighting, Cliff Caruthers’ sound and Callie Floor’s costumes. Running about two hours with one intermission, the well written “Luna Gale” will continue through Oct. 1 at Aurora Theatre Company, 2081 Addison St., Berkeley. For tickets and information, call (510) 843-4822 or visit www.auroratheatre.org.